The bèlè · Madinina, L'île aux fleurs, l'île des revenants, chalè, chalè !!! The bèlè, also known as « fine-air », brings together a dance and music emblematic of the culture martiniquaise. The bèlè is tied at the time of slavery in Martinique. Culture bèlè is primarily a legacy of Africa. In 1635, the first settlers take on the island and develop crops of tobacco and cotton. The majority of the workforce is then constituted of French workers and Indian slaves Caribbean. This in 1638 that starts the first trafficking négrière, who continues to abolition of slavery in 1848. The slaves from Africa, black, are scattered on the islands of the Caribbean. They are forbidden to speak their language, to play their own music and practice their religion. However, the slaves develop a new musical expression: the bèlè. The song and music are regarded as places of resistance. Resistance where slave reflected by the gestural and by the voice, bearing a hand of his being. What is the bèlè ? The bèlè is played with one or two drums; the « drum bèlè » (cooked with slats of tons of oak having served to aging rum) and the ti-bwa (2 sticks of wood that hits on the rear drum). The pace of basis is given by the ti-bwaté (player of ti-bwa). Two other instruments can intervene in orchestra: the kon’lambi (shell of lambi) in which one breath, which can produce sounds; and the chacha. At this music accompanied the dancing and singing. The singer begins, followed by the choirs of répondè (responders). 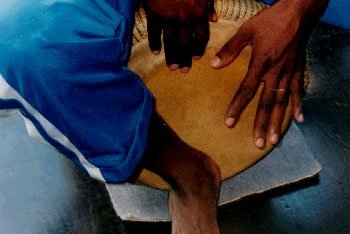 The ti-bwa gives the pace, followed by the drum bèlè. Then dancers and dancers come into play. A dialog is created between dancers and the tanbouyè (player of drum). The répondè give the response to the singer; audience can also participate. The bèlè may be danced alone, in couples, groups or even in quadrilles (groups of four, in two couples). The songs are in Creole and themes developed in songs evoke the subjects of society. The bèlè occupation : fouyétè, prepared bwa, teraj kay, cut can, manzonn and très his, kanigwé, karésé yo, lasoté, grajé mannyok, lavwa bèf, ralé senn… The songs and music accompanied the work of slaves. There are usually found in the north of Martinique, Sainte-Marie. Félix Cebarec, Berthé, Clothaire, Raoul Grivalliers nicknamed Ti Raoul, Benoît Rastocle, and the tambouyè: Raymond nicknamed Apollo Vallade, Paul and Benoît Rastocle and Félix Caserus are the most known in Martinique. The Masters of bèlè form a collective. However, they do not know of real success. The tradition, the latest players of drum, singers and dancers are few. A tour of the Masters of Bèlè is scheduled in France of November 27 to 15 December 2006. The aim is to honor the precursors of bèlè and to share a tradition. This event will also exchange and transmit this strong component of heritage Martinique. During the 1980s, the bèlè has experienced a new youth with Eugène Mona and Guy Konket (singer of gwo ka). These two artists have allowed the culture bèlè to develop and be recognized outside its borders. Edmond Mondir, singer and player drum bèlè, also campaigning since 1975 to discover this traditional music Creole. With nearly a dozen albums to its assets, it has added a touch of modernity. In Martinique, events bèlè have multiplied since several years. Now, the bèlè is recognized as an integral part of Martinique heritage. The practice in the bèlè 3 Commons in Martinique: Low-Pointe, Sainte-Marie and Inlets to d’Arlet. The bèlè has emerged in schools and associations, and has become an option optional Bachelor degree. The swarès bèlè are nocturnal meetings in which are few hundreds of people. The dance, music and rum contribute to their success. The swarès are foremostanchors a place for practising music and an opportunity for people to be back. These swarès regularly take place Friday, Saturday or Sunday. One or two swarès bèlè rythment each week and it is rare that several swarès organized at the same time on the island. During the forty days of the Lenten bèlè does not practice. The dance and music are suspended for religious reasons Catholics. This is a period considered a time of penance ranging from the terms Ash Wednesday of the day of Easter. Outside this period the swarès bèlè are regular.